Requires schools and children's facilities to share immunization and exemption rates on the school or children's facility website. 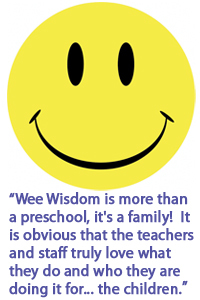 All of us at Wee Wisdom want you to know that we want to support you and your families. Please take a moment to read this and feel free to share with your friends and families with little ones. Please, please LIMIT WHAT YOUR LITTLE ONE SEES AND HEARS!! Today is indeed a sad day for the entire nation. This morning at 9:30am, a person with a gun opened fire in a Connecticut elemantary school killing 26 people. 20 of them were children. When the news media informs the public about tracgic incidents, stories and images related to the incident continue to play over and over againas more details are uncovered. Adults may try to make sense of these tragic events: although there is really no way to fully understand the violence that is happening in our communities today. As Oregon was beginning to cope with the tragic shootings at the Clackamas Mall earlier this week, another more traumatic event occurred today. We are called to unite as community agencies and child care practitioners to help parents understand and deal with the impact that exposure to violent programming can have on children. Children's cognitive development is not mature enough to analyze and synthesize violent imagery and tragic stories to the extent that older siblings and adults are capable of doing. Young children simply record the images in their subconscious mind. Subsequently, those violent images may play out in the form of nightmares, bedwetting, anger outbursts, regressive/fearful behaviors, appetitie changes; plus othe symptoms depending on each individual case. Monitor screen time to ensure children are not watching the constant rerun of the violent tragedy. Because this tragedy involved children, the reaction and fear that this might also happen to them is a natural response in some children depending on their emotional development and the degree to which they feel safe and secure. If children exposed to violent/tragic programming begin to exhibit some of the behaviors listed above or other behaviors that are not typical, allow them to express their feelings and ask questions. Assure them that they are safe and that you will protect them. You can use activities like having them draw what they are imagining and encourage them to talk about it. For the next few days while the news of this tragic event continues to flood television, internet and other social media venues, make sure adults are monitoring programs and website content to which children are being exposed. In our society, the social media is constantly relaying information. Although we may hear of violent incidents on a regular basis, explicit details are usually not repeated over and over again. A tragedy such as the deadliest school shooting in US History is going to flood TV, internet, and other social media venues for several days. If your child does experience nightmares, becomes agitated very easily or does not want to go to preschool or child care, please understand that this is a normal response to the situation. If the symptoms continue, please call your CCR&R program and/or your preferred care agency to receive additional help. Rely on the help of your child care practitioner or preschool teacher as they are a trusted part of your child's life. Parents: please read the "Licensed or reported, check preschool quality" in July 13, 2012 Oregonian. Information it is helpful for parents to consider when looking for a preschool. Wee Wisdom Preschool is indeed registered with the state and recorded with the Child Care Division. safety, background checks, first aid requirements, staff education, degrees, certification, and continuing education in child development. This leads to " a very happy place to learn"! Want Your Kid To Be Successful? Read THIS! Have you seen this article? Please take the time to read it. At Wee Wisdom, we know that play is the heart of learning. We work hard to bring your children the best environment for learning and growth through play. It is wonderful to see it validated in the press.